One of the foods that I absolutely loved when we visited Japan was onigiri. I'd never eaten these little rice balls before our trip, but soon came to rely on them for a quick, filling breakfast in the morning or for a mid-afternoon snack. It seemed that every corner convenience store had them, and there were tons of different flavors. When we returned to Stuttgart I tried to find onigiri. The closest I've come is Waraku in Düsseldorf. Taking a 3-hour journey every time I have an onigiri-craving hardly seems practical, so I decided to learn how to make my own. I often use the recipes from San Francisco blogger JustOneCookbook when I'm craving Japanese. Her clear step-by-step directions and helpful videos make even the most intricate recipes seem simple. I can also usually find most of the ingredients that are required at our local Asian market. When I first started making this onigiri recipe about a year ago, I really had trouble crafting the perfectly shaped triangles that I'd seen in the convenience stores. My hands are rather small to begin with, and often times my hand-crafted onigiri would fall apart as soon as we picked them up to eat them. Eventually, I bought these really cheap molds from Amazon that have made making onigiri that much easier. Now I've got the onigiri-making down to just half an hour. In fact, the most time-consuming part of this recipe is the rice, which takes a little over an hour to do right. Despite the time, I like this rice recipe and use it whenever I want fluffy, Japanese-style rice on its own or with other saucy dishes. I especially like it because we don't really have room for a rice cooker in our tiny apartment, but with this recipe the rice turns out just as good, so there's no need for one. 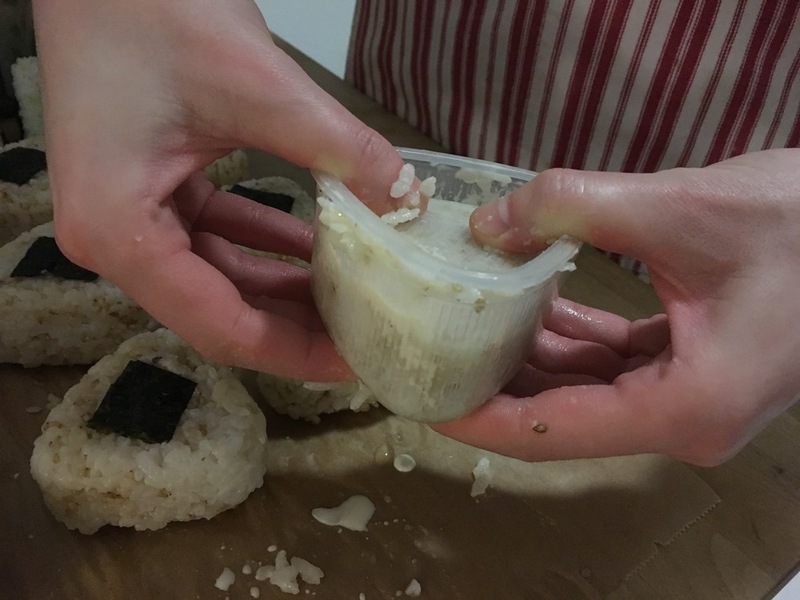 I've taken a few pictures of my last onigiri-making session so you can see what the process looks like. I stuffed my rice balls this time with my two favorite fillings: tuna mixed with Japanese mayo and green onions and avocado with Japanese mayo. I also got a bit creative and added some soy sauce and sesame seeds to the rice that I used for the larger tuna onigiri. For decoration, I wrapped the bottom of the smaller avocado onigiri with a rectangle of nori (seaweed) and stuck little nori squares onto either side of the tuna onigiri. The great thing about onigiri is that you can make them with just about any filling. In the past, I've made them with curry chicken, teriyaki pork, and soy-soaked bonito (dried fish flakes). Sometime in the future, I'd also like to try edamame and sweet potato as fillings. Onigiri make a great weeknight dinner when paired with an Asian salad or miso soup. They'll also keep in the fridge for two or three days and make a delicious and easy lunch. If you have any liking for Japanese food, then you should definitely try this recipe. See JustOneCookbook's onigiri recipe here. See JustOneCookbook's rice recipe here.